A unique telematics system that keeps you CONNECTED with your vehicle from your mobile app. 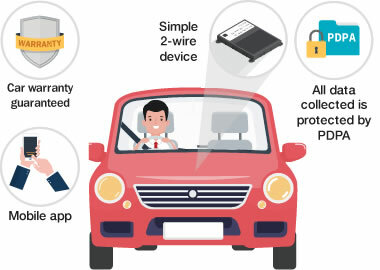 That’s not all… CSE MetaTrak Connected Car also brings you Emergency, Security and Smart Drive which will give you peace of mind, wherever your journey takes you. In case of an emergency (e.g. if you are having a sudden heart attack), click the SOS button on your DriveJet mobile app to call our Secure Operating Centre (SOC). Our SOC will verify your needs and dispatch the nearest medical assistance to you as quickly as possible. In case of an accident, MetaTrak automatically detects the collision whenever the impact threshold is exceeded. The system will send YOUR EXACT LOCATION to our SOC. If the crash severity is high, our SOC will direct emergency response services to you immediately. If your vehicle battery is disconnected, you will receive a theft alert followed by a call from our SOC. 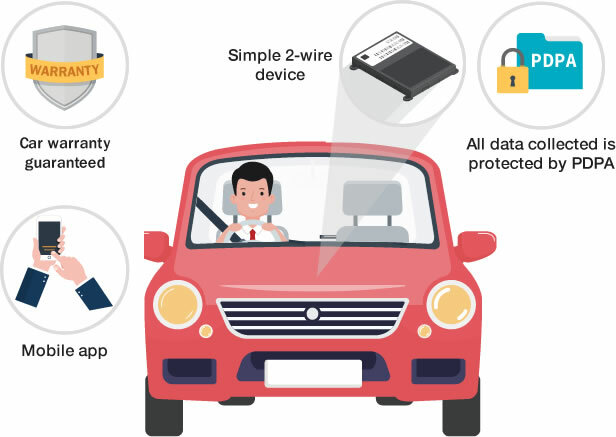 You can activate secure mode to protect your vehicle with our Virtual Alarm. If your vehicle is driven with secure mode activated, you will receive a theft alert. If your car alarm triggers, you will receive an alarm alert. Did you know that you can earn up to 20% discount on top of your NCB? What is the ADR tag button for? ADR tag button is for emergency immobiliser override. If the immobiliser is activated through the DriveJet mobile app and cannot be deactivated (e.g. due to no GSM coverage or mobile data), press the ADR tag button inside the vehicle to override the system. What should I do when I receive notification that my ADR tag battery is low? Replace the battery CR2032 with new immediately. You can purchase it at the nearest authorised dealer or any electronic shop. To request for a new ADR tag, please contact your nearest authorised Dealer. Can I have more than 2 ADR tag? Yes, you may acquire up to 4 ADR tags per car. Click on the “Forgot Password” option on the app to reset your password or call SOC for assistance. If I have more than one vehicle, can I view them simultaneously in the mobile app? Yes, you can manage your cars simultaneously under the multi vehicle management in your mobile app. Yes, you can. You can even download on your tablet or ipad. All our devices come with internal memory units. When you enter into a location without GSM coverage, all events and tracking information will be captured and stored into our device memory unit. All the stored data will then be transmitted to our servers when the GSM signal is restored and none of the tracking data will be lost. You can call our SOC for further assistance. Where and how do I renew my subscription? Privacy is our highest priority. SOC will only initiate tracking upon receiving alert automatically from your car and will proceed to track your stolen vehicle after verifying with you and when you have confirmed that your car is being stolen. If it is a false alert, SOC will terminate the alert and disable the tracking. How to set Ignore mode? You can set Ignore mode through your mobile app to ignore all alerts. However, please note that when you activate Ignore mode, the system will no longer receive any security alert notifications and all services will be compromised. Compensation Guarantee (CG) does not apply when the vehicle is in Ignore mode.